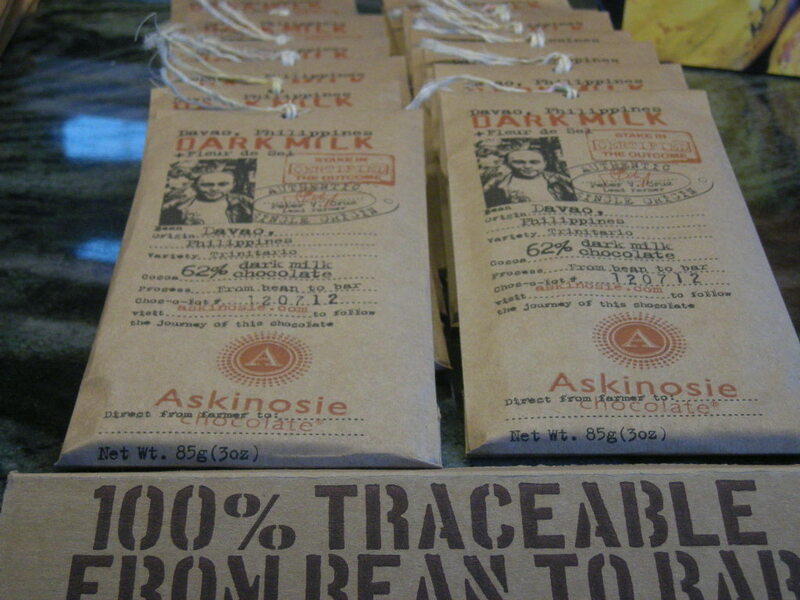 The Premium Chocolate Movement: The treat of centralisation. five-year contract for the organically grown beans at a guaranteed price of USD$1.75 per pound. their high level of quality, or the new trade links that benefit growers. and their production output is limited by the size of the machinery. In order to remain profitable, premium chocolate producers must be able to cover these costs, and make a margin above them. In order to persuade consumers to pay this high price, they must first be convinced of premium chocolate’s value. discuss how a winemaker may produce a distinctive wine. 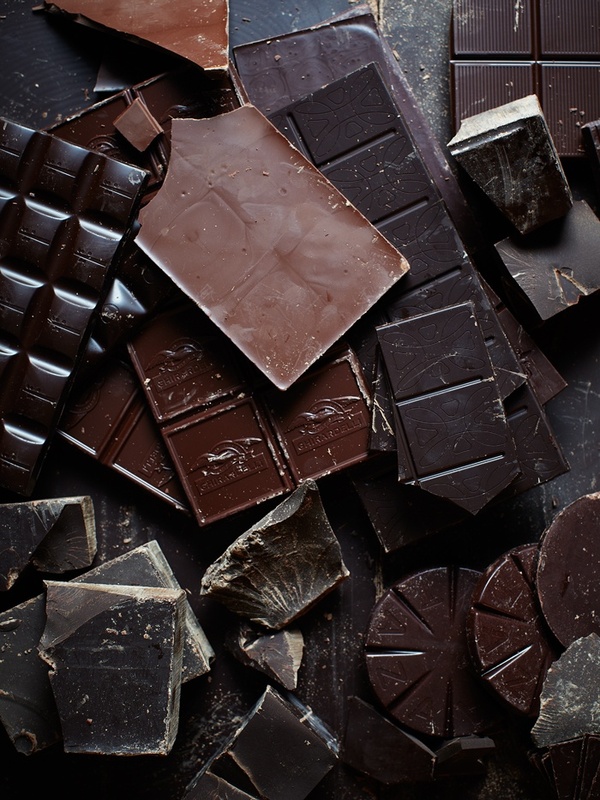 topics from taste, to production, to the sourcing of equipment for chocolate manufacturing. chocolate lover’s enjoyment as an understanding of the winemaking process is to a wine connoisseur,” and many in the premium chocolate industry are offering consumers first hand experience of the process. In my time with Silvio Bessone two separate groups visited his workshop. He gave each group an overview of his chocolate making process and the choices he makes at each stage. The tour included a tasting of selected products to understand better how those choices impacted on the chocolate. Taza chocolatier Alex Whitmore leads tours to the plantations with whom they have Direct Trade relationships to teach consumers about cocoa cultivation. workshop in Brooklyn, and articles detailing the day in the life of a famous chocolatier. a guaranteed buyer for their crop, empowering them to invest in long-term activities that will further improve the quality of their beans. 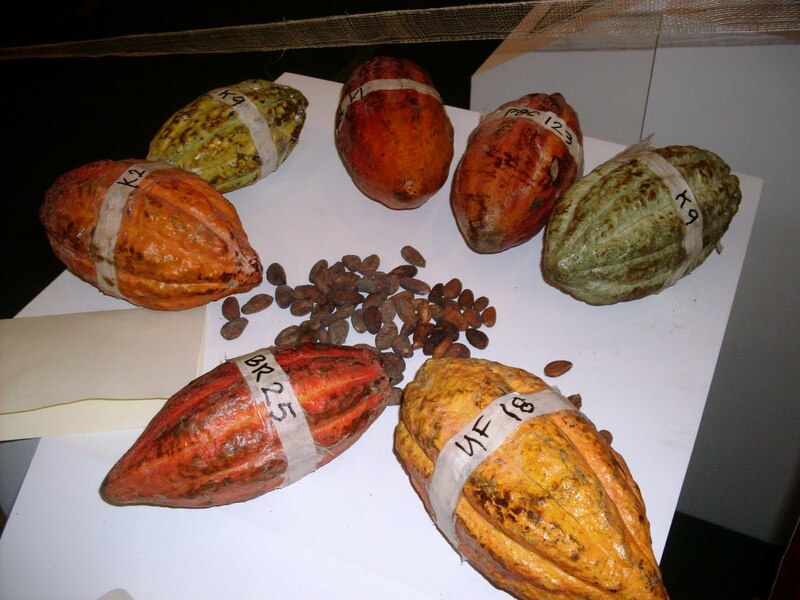 The International Cocoa Association (ICCO), recognising the potential of this system, have initiated several projects to help reestablish a premium trade chain. These include a supply chain management initiative called “Total Quality”, that separates cocoa bean lots so that quality beans can be identified and sold directly to buyers. They have also initiated a competition called “Cocoa of Excellence”. These awards are modelled on the highly successful Cup of Excellence (COE) awards in the specialty coffee industry, in which small batches of quality coffee are blind tasted by a panel of experts, and given a rating out of 100. 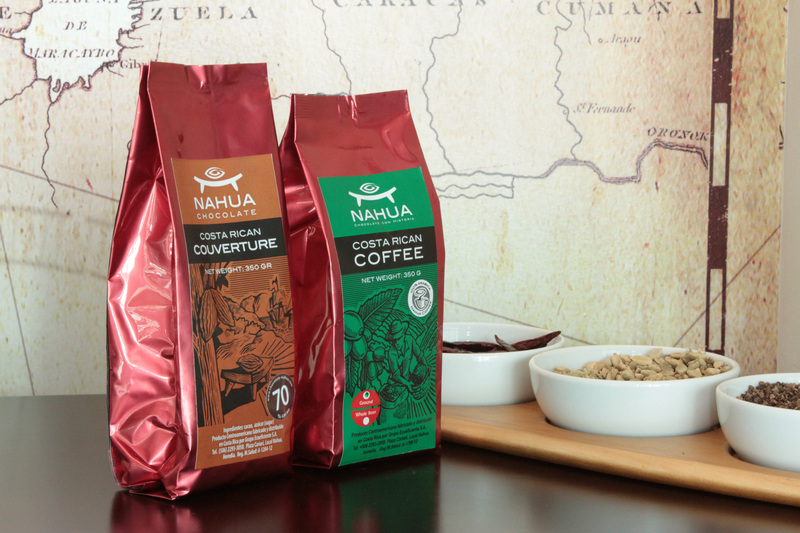 The coffees that score over 90 are auctioned to speciality buyers who attend the event. Consulting firm McKinsey & Company audited the award system in Nicaragua in 2006, and determined that it helped Nicaraguan coffee producers, cooperatives and exporters to earn an additional $USD1.1 million profit, and considerably strengthened Nicaragua’s specialty coffee industry. Whilst the ICCO initiatives are in their infancy, they are positive steps to the creation of an alternative system of trade, one that rewards growers financially for quality beans. In February 2011 Susie Hoban spent two weeks working with Italian chocolatier, Silvio Bessone, in his workshop in Vicoforte, in the southern part of Piemonte, Italy. Bessone begins his chocolate-making process with the bean. Using an old Vittoria machine, Bessone roasts the beans, 25kg at a time, with a direct gas-powered flame. The time and temperature he uses depend on the bean. For a combination of chone and calceta beans that make up Bessone’s single-origin Ecuador blend known as Quinche, the temperature is 150° celsius and the roasting time 32 minutes. Bessone’s recipe for Quinche, which he devised himself over many years of trial and error, calls for 122kg of beans. Once roasted, the beans are carried to the winnowing machine which removes the skins and outer shells, and cuts the cocoa flesh into small pieces, known as nibs. From 122kg of beans, Bessone will have 67kg of nibs. These are moved to a mixer which is a large cast iron machine that circulates the nibs under two heavy stone rollers. For Quinche, Bessone adds 60kg of fine sugar powder to the cocoa liquor in the mixer, and lets the ingredients mix for 24 hours. 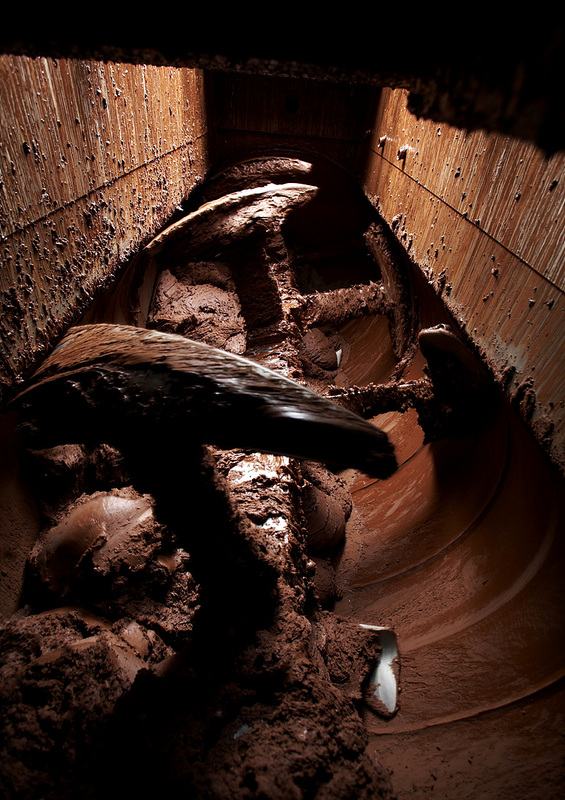 As the nibs are crushed, cocoa butter is released which coats the solid particles of cocoa and sugar. By the end of the process the previously dry ingredients form a paste known as cocoa mass, or cocoa liquor. At the end of the mixing process, the particles in the cocoa liquor may still be up to a millimetre in size. These need to be reduced to at least 20 microns in size in order to give the final chocolate a smooth mouth-feel. This is the equivalent of smashing a brick into sugar grain-sized pieces. Because the sugar content of this particular cocoa liquor is 45% (60kg of sugar to 67kg of cocoa liquor), Bessone can use the five-roll mill. The rollers are stacked vertically and each operates at a different speed, the slowest on the bottom and the fastest on the top. Bessone scoops the cocoa liquor into the bottom of the mill, and it naturally adheres to the faster moving roller, moving up the stack of rollers until, at the top, it emerges as a fine flakey substance. The five-roller mill can process the entire batch of cocoa liquor at once, however it requires a lot of friction which is why it can only be used when the cocoa liquor contains at least 45% sugar. For other cocoa liquors Bessone uses the ball mill, a much smaller machine with a drum in which thousands of tiny metal spheres are rotated to break the particles of the cocoa liquor down. Because of its size, the ball mill can only handle up to 20 kg of cocoa liquor at a time. However it is milled, the cocoa liquor will then go to the conche. During this process the cocoa liquor is kneaded until it reaches a viscous-liquid state, in an open-top vat which allows volatile phenols to escape, taking with them some acidity that Bessone does not want in his final product. The beans used to make Quinche are delicate and quite mild in flavour, so in this instance the cocoa liquor is conched for only 24 hours. Other cocoa liquors may require up to three days in the conch in order to achieve the ideal flavour attributes. In the last hour, Bessone adds 18kg of additional cocoa butter, and a small amount of soy lecithin. The extra cocoa butter gives the chocolate a creamier mouth feel and the soy lecithin acts as an emulsifier, connecting particles within the cocoa liquor to create new surfaces that will be covered in the cocoa butter fat. The final step in the chocolate making process is tempering. This involves increasing the temperature of the cocoa liquor to approximately 38° celsius, then reducing it quickly to around 29°. This process sets the cocoa butter crystals in the formation required to achieve a sheen on the chocolate’s surface, and a good snap when broken or chewed, both desirable attributes of quality chocolate. 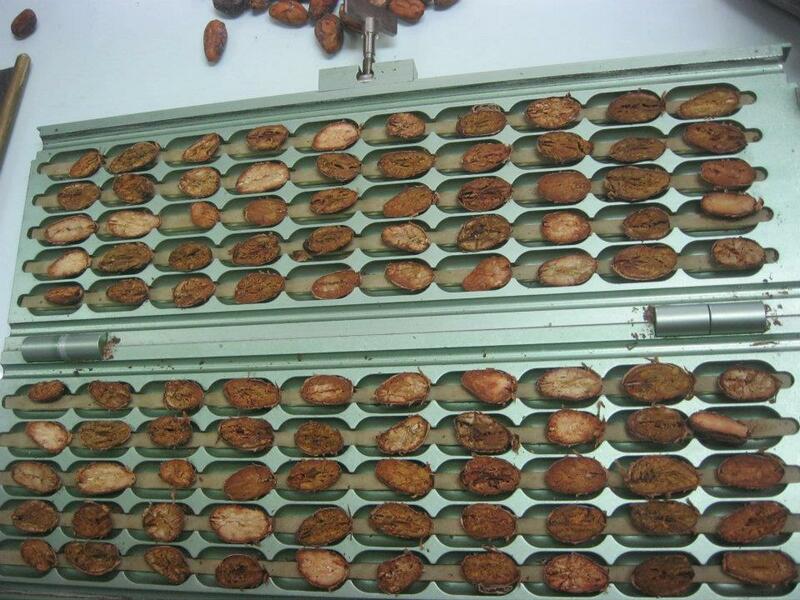 The tempering machines work in a circular fashion. Cocoa liquor is heated in a vat then pumped upwards and poured out of a tap above. Within the tap are cooling elements that quickly reduce the temperature of the flowing chocolate. To make a chocolate bar, a special attachment on the tap directs the chocolate flow into nine thin streams that align perfectly with the squares in a chocolate mould. Using a pedal to briefly pause the flow, Bessone places the mould directly under the streams to fill the squares, and then refrigerates the mould to allow the chocolate to set. Silvio Bessone marks every item he makes with his own image: his chefs’ toque and signature goatee are captured in a silhouette that sits above his name on almost all his packaging. And why not? His product is as individual as its maker. Bessone is one of a growing number of chocolatiers who are creating chocolate from the bean. Known as “bean-to-bar”, these small artisanal chocolatiers are creating truly individual chocolate by controlling the entire process, making dozens of decisions from the moment they select the bean till they wrap the final bar of chocolate. industrial revolution transformed it into a smooth and refined substance. “It’s a polarizing product” admits Taza chocolatier Alex Whitmore, “there are people who are totally into it and that’s all they buy.” Then there are those who “eat it and spit it out”. Gianluca Franzoni of Italian chocolate company Domori is also a champion of the bean. 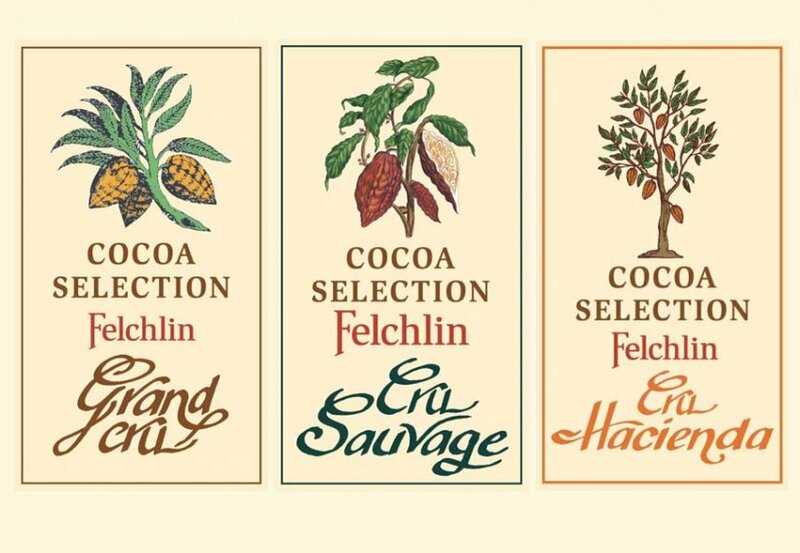 Their famous Chuao and Criollo chocolate bars are made with cocoa from the Hacienda San Jose plantation in Venezuela. 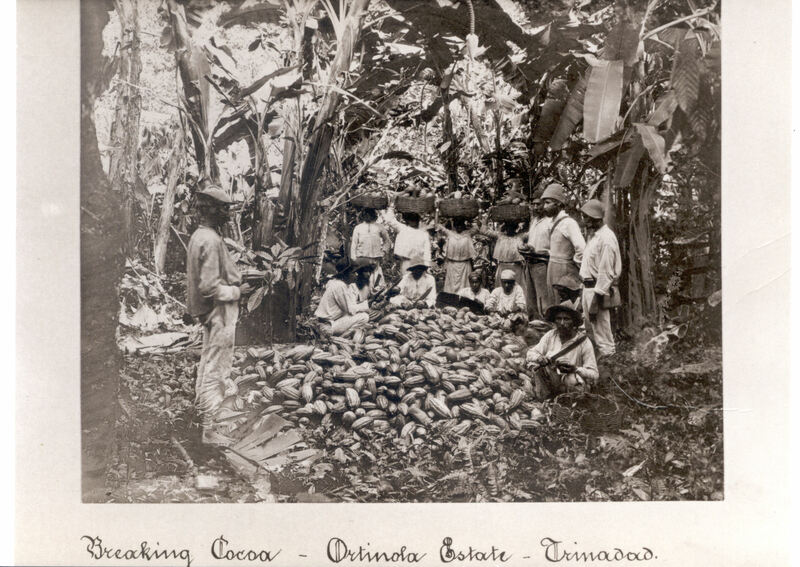 Here Franzoni works in partnership with the plantation to revive nearextinct strains of the Criollo variety of cocoa. Franzoni never adds extra cocoa butter to his chocolate, instead he relies on the cocoa butter that exists within the bean to carry its flavours. Domori bars have a stronger snap than most, and it takes a little longer to melt in the mouth, but once it begins, Domori chocolate releases a rich complexity of aromas with an unusually long finish. add more sugar, because cocoa butter is a vehicle for the subtle aromas of a bean. Bonnat chocolate has a low-snap and creamy mouth feel with a rhythm of aromas that move in succession across the palate. Delivery by DHL this morning !! So sorry to find chocolate so messed up by DHL transport delivery!! What normally is a delight for me, opening boxes with chocolate, just became a nightmare today! Inspired by the passion for Mexican chocolate traditions, TAZA hand-carve granite millstones to make these rustic, organic dark chocolate discs bursting with bright tastes and bold textures. Chilis are often added to chocolate in Mexico for a spicy kick. We grind single-origin Dominican cacao using vintage Oaxacan stone mills to preserve its complex flavor and rustic texture, then blend in organic chilis. The result is a bright, bold chocolate that perfectly balances sweet with heat. Whole organic bourbon vanilla pods from Villa Vanilla Spice Plantation in Costa Rica are ground together with single-origin Dominican cacao in vintage Oaxacan stone mills to make this sweet, fragrant chocolate. Stone grinding preserves the bright flavors of our premium ingredients and leaves an addictive rustic textures in the finished discs. Cinnamon is the traditional partner to chocolate in Mexico. We grind whole cinnamon sticks together with organic Dominican cacao using Oaxacan stone mills. Our simple stone-ground process gives Taza Cinnamon Chocolate Mexicano its intense flavor and distinctive rustic texture. Makes a great Mexican hot chocolate.